This was a question in a test in my school today. Q) Which intermediate of Krebs cycle further can form chlorophyll? How can Succinyl CoA form chlorophyll? All I could find was related to porphyrine ring. Can anyone explain it or recommend a good source? This reaction is catalyzed by mitochondrial δ-aminolevulinate synthase. Two molecules of δ-aminolevulinate condense to form porphobilinogen, the next intermediate. Four molecules of porphobilinogen then condense head to tail to form a linear tetrapyrrole in a reaction catalyzed by porphobilinogen deaminase. The enzyme-bound linear tetrapyrrole then cyclizes to form uroporphyrinogen III, which has an asymmetric arrangement of side chains. This reaction requires a cosynthase. In the presence of synthase alone, uroporphyrinogen I, the nonphysiologic symmetric isomer, is produced. I suspect that the person who set the question is an animal or biochemist who thought he would try a variant of the standard question “which intermediate is a precursor of haem”, and ventured into waters where he was out of his depth. This is a poorly set question. If any one member of the Krebs Cycle is used as the raw materials in a biosynthetic pathway, it will follow that all of the other members are also part of the same biosynthetic pathway, since they are part of the same cycle. 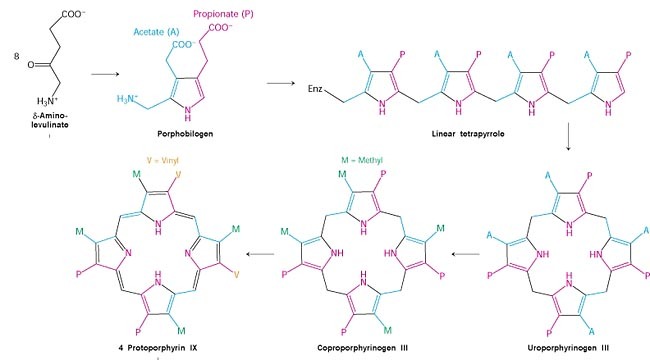 The full biosynthetic pathway of chlorophyll is a very complex process, and there are dozens if not hundreds of different steps and enzymes involved. This is one paper that attempts to cover the issue. Not the answer you're looking for? Browse other questions tagged biochemistry homework photosynthesis cellular-respiration or ask your own question.